I was looking forward to this event, 'An event for nerds or introverts' as Peggy put it. In fact, Asia-Link Sketchwalk Kuching 2017, might be the best thing for introverts to get together and be extroverted together. Sketchers like ourselves love it when Asian regional chapters come together to sketch and share, learning and discovering through one sketch at a time. All four days were full of sketchwalks, sharetalks and eating delicious Kuching delicacies. 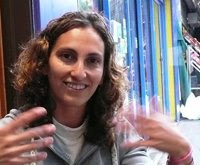 It was lively, full of joy and fun, mingling and getting to know each other. 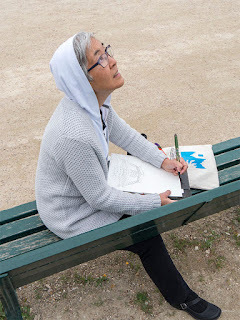 As urban sketchers, we normally share through social media platforms such as Facebook, Instagram or Flickr, sharing admiration towards fellow sketchers, but here we met them face to face and it was as though as we actually knew each other already! 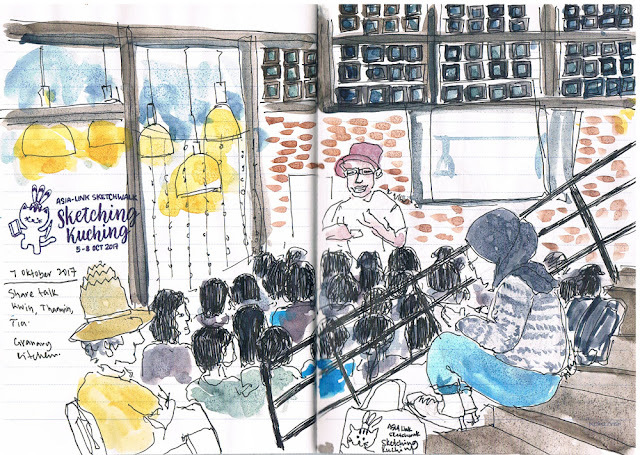 What enriches the experience of being at an event like this is to meet and connect with them in person – it’s an open library of urban sketching art. 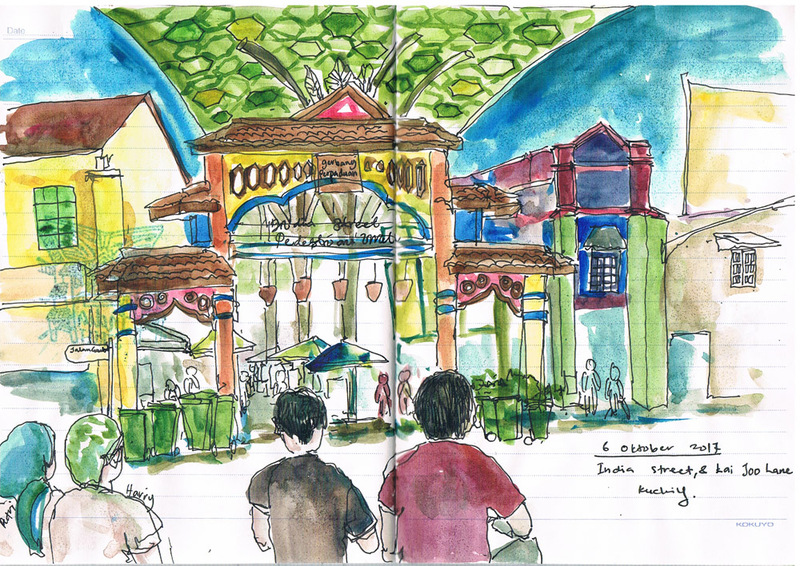 Follow me through my sketching adventures at the Asia-Link Sketchwalk: Kuching, Borneo, Malaysia. 5-8 October 2017. These scenes are some of my favorite to capture in sketchbooks. Those wooden windows of which the residents hang dry their clothes. It is a great scene and the view isn't blocked by any passing cars. Our main place to gather is The Granary Kitchen & Bar. 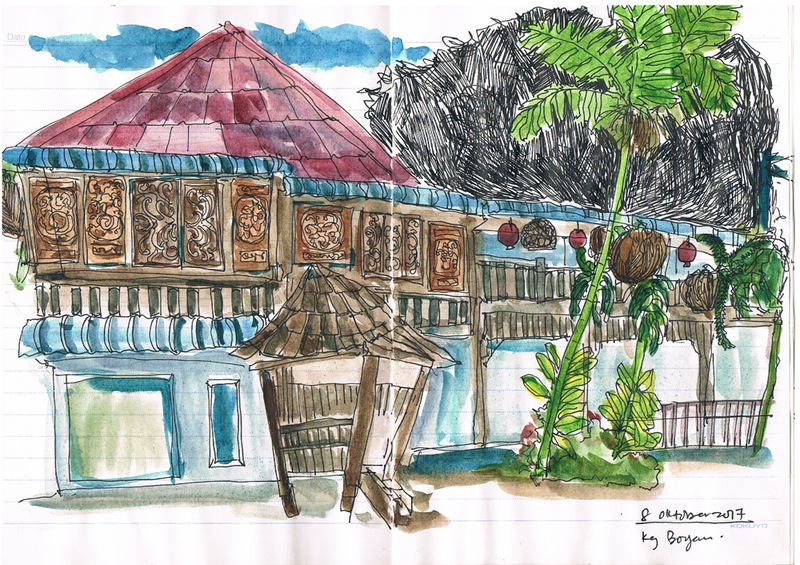 The talks and workshops are conducted here for the three days of Sketchwalk: Kuching. 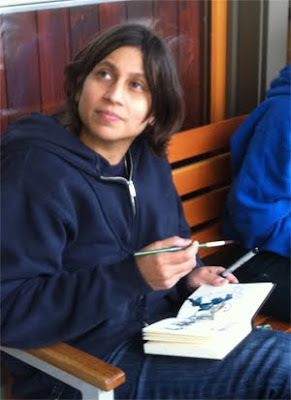 As usual, the Asia-Link Sketchwalk offers two passes – the Sketch Pass and the Workshop Pass. 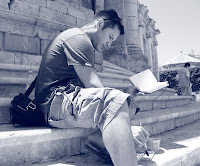 If you aren't able to get a workshop pass, it doesn't matter, you can still learn among friends with the Sketch Pass. These get togethers are the best way to seek advice, share and learn. 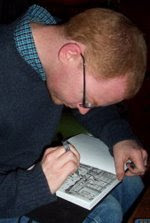 Our first day of the sketchwalk started not far out from our base at Granary Kitchen & Bar. Walk along the river Sarawak, it is simply awesome. The park of shady trees stretches along the road providing shelter for sketchers to capture the pleasant scene. 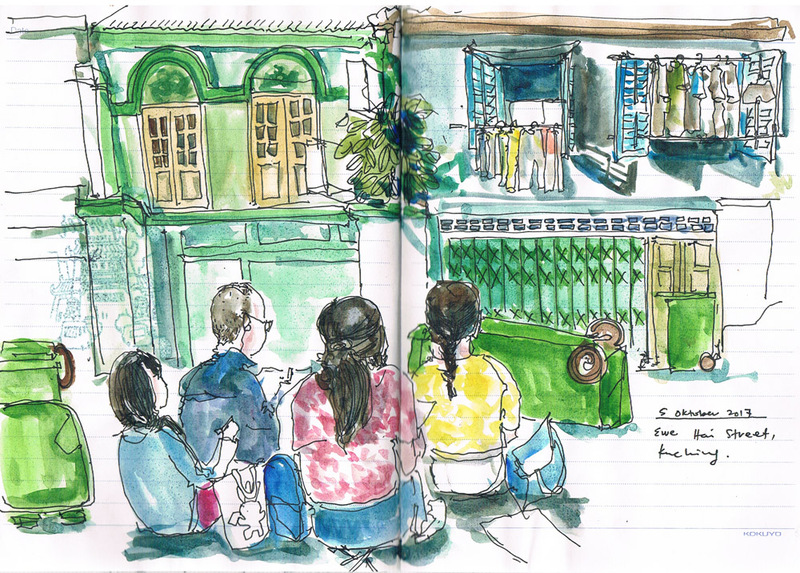 For the evening sketchwalk I went to the front entrance of India Street to sketch the colourful entrances. Further along India Street, Kai Joo Lane offers lots to sketch too. The Old Courthouse was once the administrative center of the government of Sarawak. It has a nice garden with a big lush tree. Further along the street is Gambier Street and the spice market – an interesting morning was spent capturing the local daily life there. Every now and then, local passersby were intrigued, they were curious as to why so many sketchers lined the road sketch/painting drawing all at once. Most of them would have thought it is an international drawing competition! 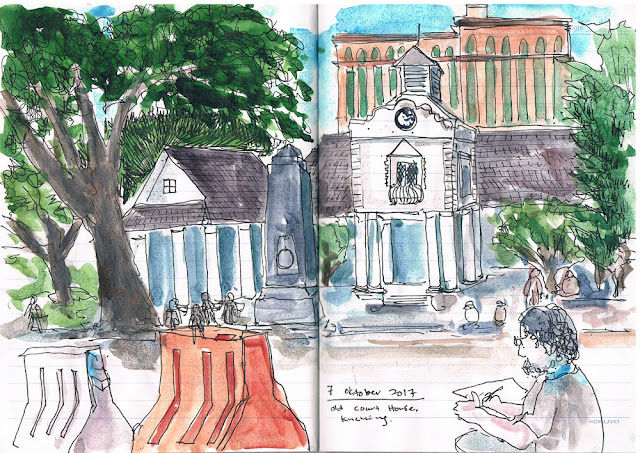 These two places were not really on the suggested places to sketch list, but once we discovered the Brooke dockyard is nearby, we continued our sketching there for the day. 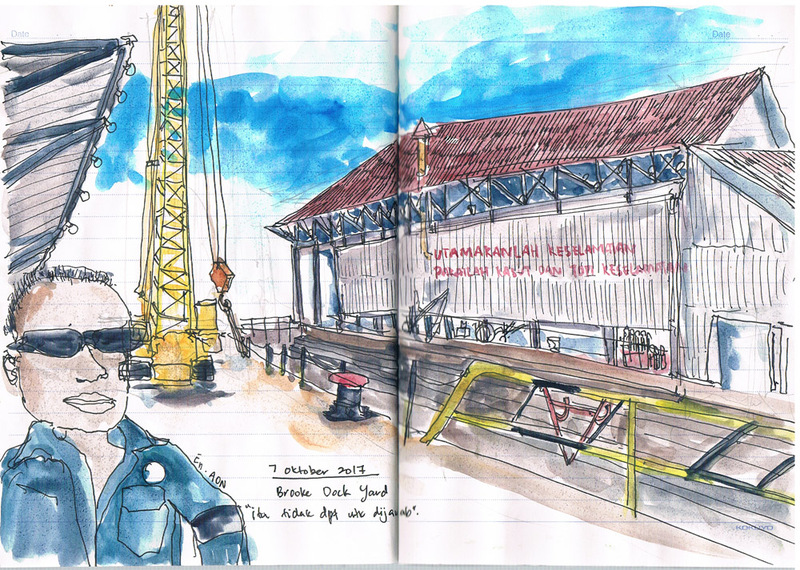 The guard was concerned for our safety as the dockyards are old (they are listed as a Unesco heritage site) but our organizer and the guard are able to come to an agreement and we sketched there safely. The guard himself, Mr Aon, is worth to sketch too, he was by himself most of the day and it made his day seeing all these sketchers, each creating their own unique drawing. He did a great job of looking out for the safety of everyone while answering questions regarding the history of the dockyard. He managed to answer and look cool about that. Our third and final day featured a very special morning sketchwalk. Early in the morning we crossed the river by boat – just as locals have always done. A new bridge is completed but Peggy Wong, the Kuching lead, had the special intention of our next sketches taking place crossing the river, so we could experience the boat ride and absorb and understand the history despite progress. It was raining heavily on that Sunday evening so some of us arrived late. 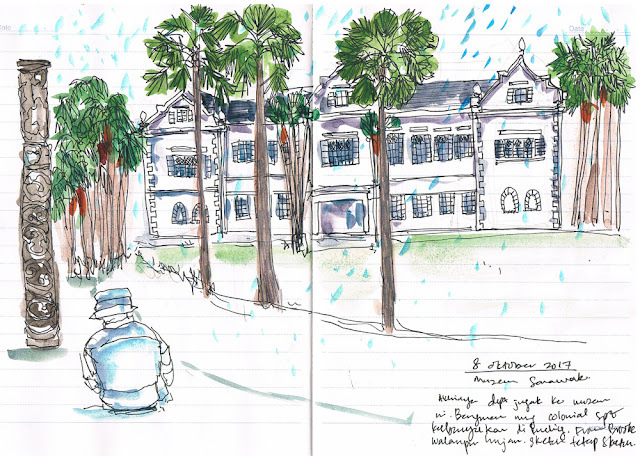 While most of us were unable to sketch outside on the lawn of the Sarawak State Museum, some of us did manage a sketch by sheltering in a building surrounding the Museum, others sketched inside the museum too. It rained so heavily, we didn't get to gather at Padang Merdeka (a big field nearby) for the big group photo as suggested. Instead we managed to photograph all 300 sketchers back at The Granary Kitchen. It may have been raining for much of the day, but that didn't stop us sketching. Marni Zainodin is a postcard illustrator, mail art artist and travel sketcher who loves walking too. She works in a souvenir shop in the Cameron Highlands, in the region of Pahang, Malaysia. 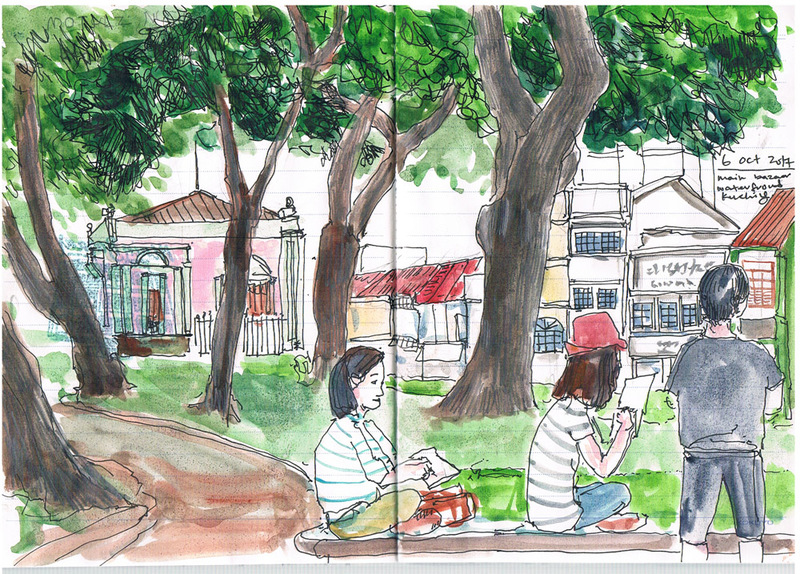 She often travels five hours to join the Urban Sketchers Penang Sunday Sketchwalk. See more of her work here and here.